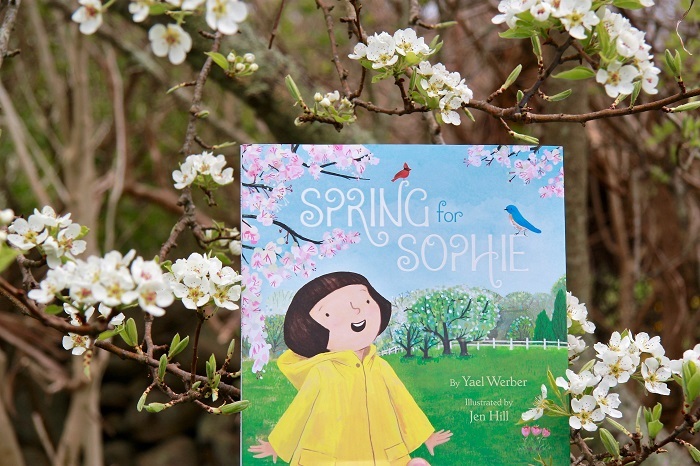 This spring we added a beautiful new book to our collection—Spring for Sophie by Yael Werber and illustrated by Jen Hill. I was drawn to it because its heroine shares a name with my late grandmother, who also loved spring. The girls and I have enjoyed reading it as the late winter months have melted into the green, blooming landscape we’re now enjoying. In Spring for Sophie, Sophie’s parents encourage their daughter to use her senses to tell when spring has arrived. Her mother tells Sophie that the first sign of spring is the sound of the birds returning. I grew up in New England, where winters can be bleak and spring is long awaited. To me, more than the early flowers, the sound of the birds and their spring calls is the true harbinger of spring and the hope of warm, wonderful days ahead. Even as an adult, I love hearing the before-dawn birds on early spring days, recognizing their calls and knowing that longer, flower-filled sunny days are just around the corner. The girls and I appreciate—and read about—birds year round. Winter has been a time for us to watch and feed the backyard birds that stay, a responsibility the girls take very seriously. We keep our window feeder well stocked with birdseed, which makes for excellent indoor bird watching. 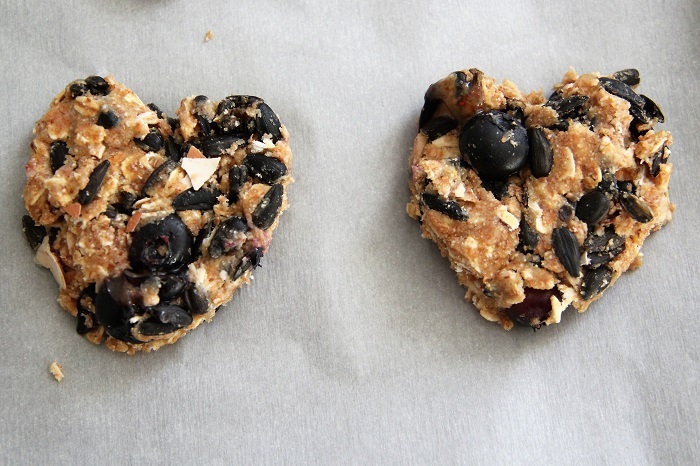 We even cook up the occasional bird cookies for our feathered friends. 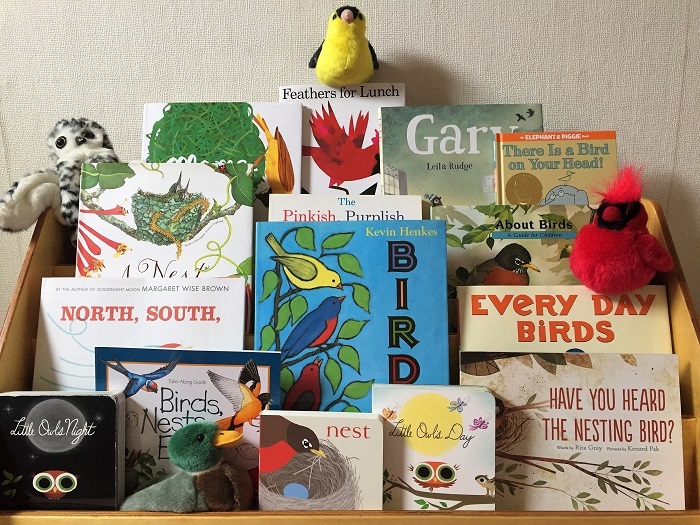 This spring, I decided to round up some well-loved and new books about birds to really dive into the subject with the girls. Spring for Sophie set the stage for us to listen for the birds to return and sing of spring. National Geographic Kids Bird Guide of North America is a handy reference we keep by our window feeder. New or interesting birds we spot can be quickly looked up. Full-color photographs help us identify newcomers. Fun facts for featured birds are a bonus. Less packable but even more approachable for younger readers, the About Birds: A Guide for Children is a child-friendly crash course about birds including nests, eggs, and the characteristics of the fully-grown and flying species. While the former is a reference book, the latter is a bedtime read at our house. 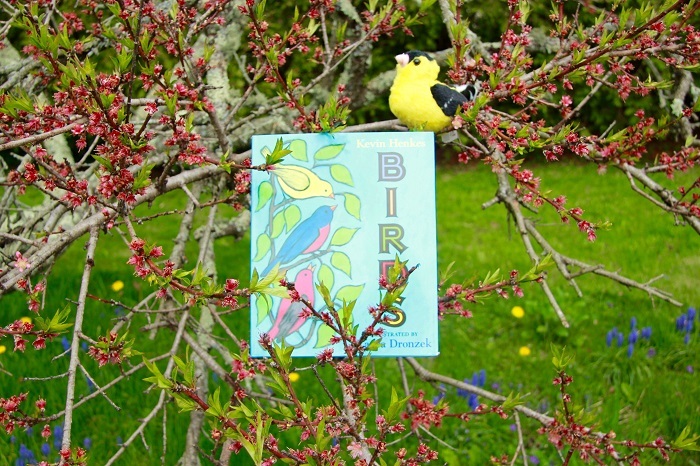 In Birds by Kevin Henkes, a little girl watching the birds from her own window sparks a lovely exploration of birds and how they are like us—a connection lacking in the traditional bird guide. One of many interesting aspects of birds is their nests. Lately, many of our library selections have been on that topic. Here are some of our favorites. Have You Heard the Nesting Bird by Rita Gray and illustrated by Kenard Pak juxtaposes the familiar call of songbirds with the quiet mother bird in her nest, waiting for the baby birds to hatch. While she waits, the reader hears the many unique calls of other birds. The last two pages, set up much like an interview with the mother bird, offers an explanation of her silence as well as facts about other mother birds and babies. A Nest is Noisy by Diana Hutts Aston and illustrated by Silva Long is one of many similar nonfiction texts in our collection (along with the very applicable An Egg is Quiet). It goes beyond birds, but is fascinating in both its text and its illustrations. It has us searching for nests of all kinds this spring. Mama Built a Little Nest by Jennifer Ward and illustrated by Steve Jenkins also goes beyond birds but is an irresistible bird read. Alternating between poem and nonfiction description, the book tells about the unique nests that mommy (and daddy) animals build for their nestlings. 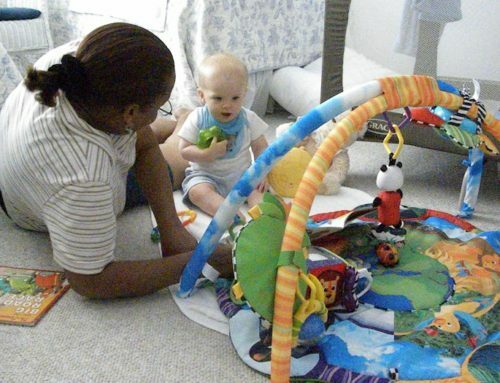 At the book’s end, it makes the connection for the youngest readers that their nest is called a bed! Nest by Jorey Hurley is appropriate for the youngest of readers. It follows a baby bird from egg to back to nest in a beautifully illustrated cycle. I bought it because I thought Winter would like it for its simplicity. But it was Willow who understood it and loved it most. Gary by Leila Rudge is a silly story about a racing pigeon that cannot fly. One day, when Gary falls from perch, he embarks on an unexpected adventure. Spoiler alert: Gary finds his way home, much to the relief of my little readers, but he’s endearing and his adventure is authentic nonetheless. When we visit New York City, we always think we spot Gary! 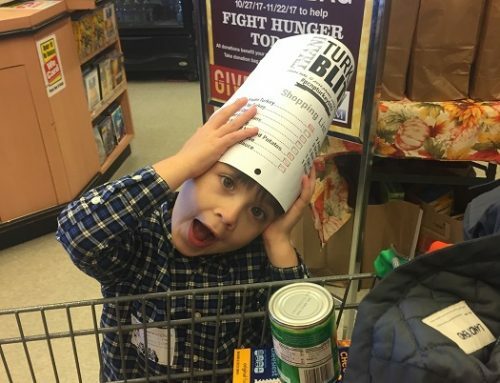 There is a Bird on Your Head by Mo Willems, featuring Elephant and Pieggie, is a mainstay in our house… even more than his illustrious Pigeon. When not one but two birds—love birds!—decide to nest on Gerald’s head, hilarity ensues. This book about nesting birds with our favorite friends is in constant rotation. 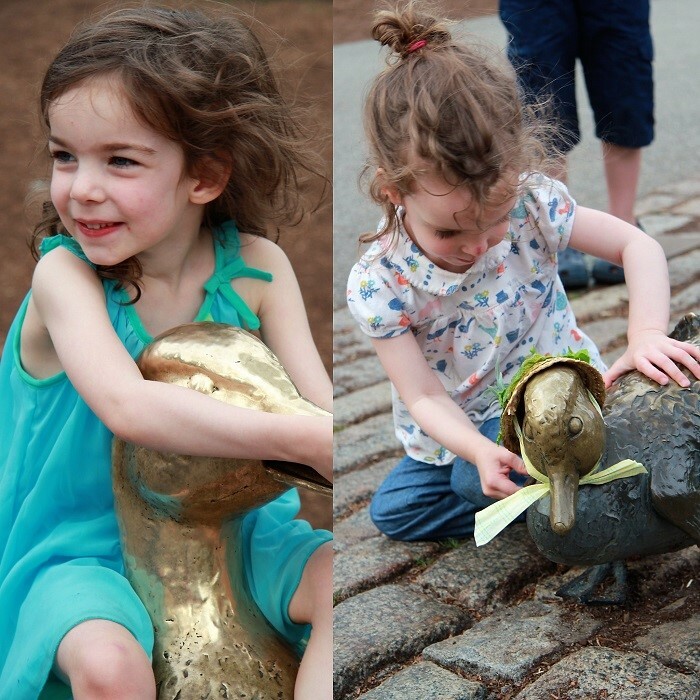 Make Way for Ducklings is a family favorite, one that inspired a recent day trip to Boston Public Garden. 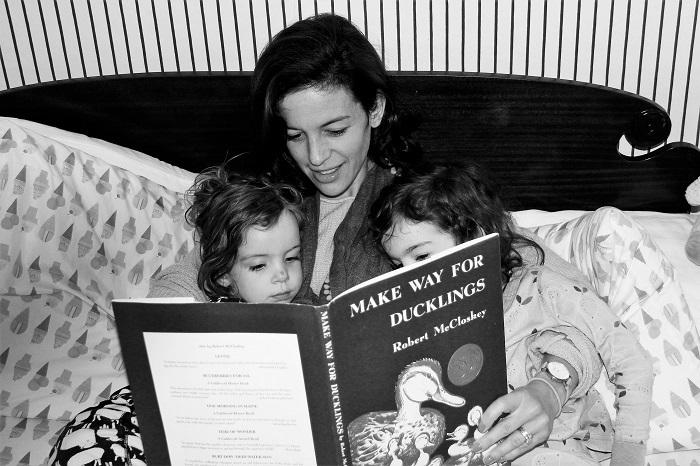 After enjoying the classic Robert McCloskley book, the girls and I traveled to nearby Boston in search of Mr. and Mrs. Mallard and their famous ducklings—Jack, Kack, Lack, Mack, Nack, Ouack, Pack, and Quack. 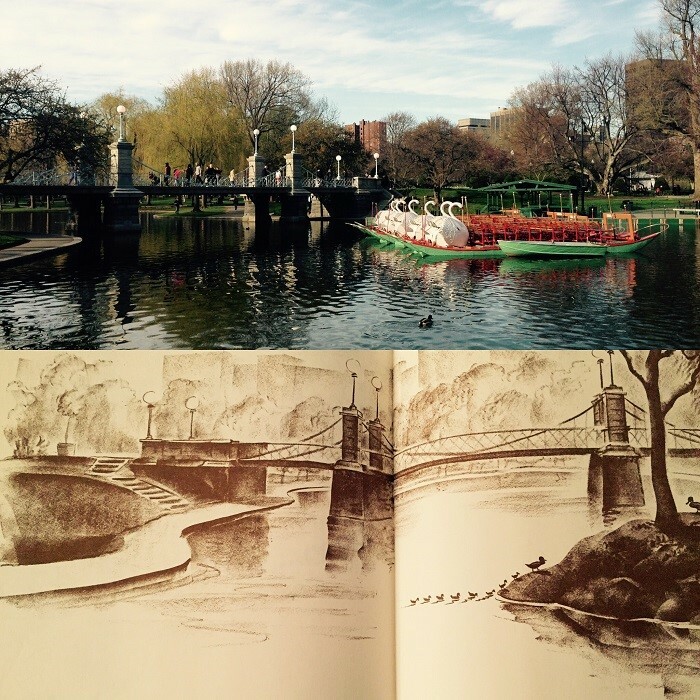 Our search revealed many familiar sights from the pages of our children’s book. 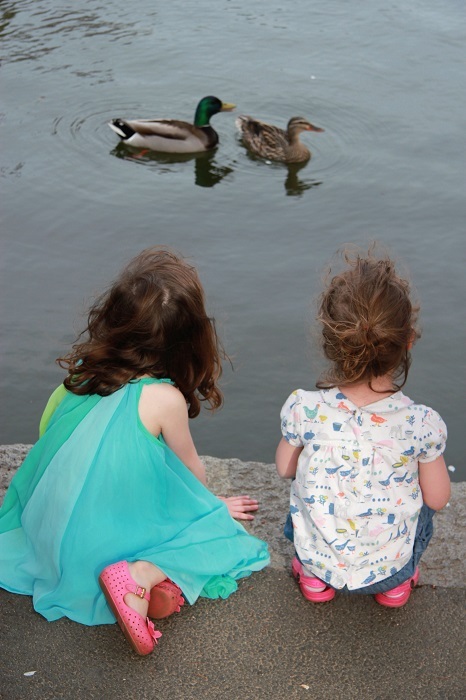 The girls fed a pair of mallards we endearingly named Mr. and Mrs.—though we didn’t spot their eight ducklings. But it was some consolation to see them in bronze in the park. 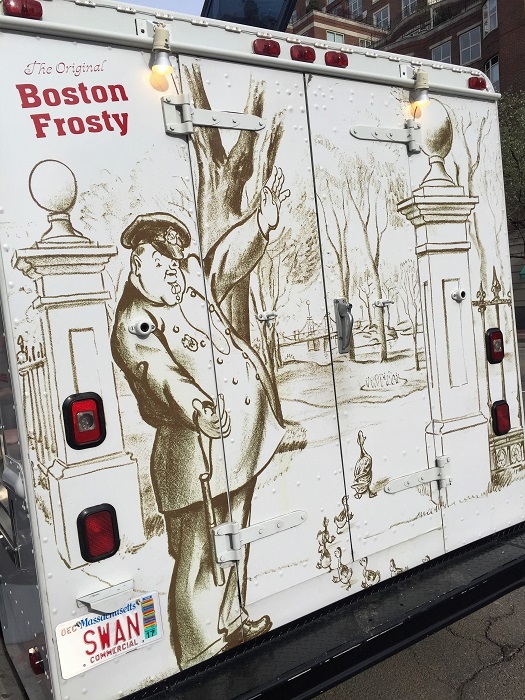 Though Winter was disappointed not to see Michael, the policeman who helps the mallards travel through the city to the Public Garden, we were pleased to spot him on the back of the Boston Frosty ice cream truck. Reading about birds reminds us that if we look, listen, and read, we can learn many interesting things about the birds that sing outside our windows in spring. Even before I had children, I loved bird watching. Before the girls were born, Central Park was one of my favorite places to look for birds in spring. In addition to the iconic New York City pigeon, hundreds of bird species either call Central Park home or stop to rest along their migratory path in both spring and fall. If you’re an avid bird-loving adult in the tri-state area and you’d like a grown-up book recommendation, you might enjoy one of my favorites, Birds of Central Park. Better yet, sign up for a guided tour through the Central Park rangers or other private birding groups! As a bird nerd, I can’t help but bring the girls along for birding expeditions. Since they’re still young, we keep bird watching simple. Here are some tips we try to use whether we are watching birds in our own backyard or we have scoped out a bird watching spot in advance. Simplify strategy. Talk in advance about the birds you might see or are looking to spot. Listen to the birds’ calls. If possible, bring a bird guide or download an app in advance for reference. We like this one! 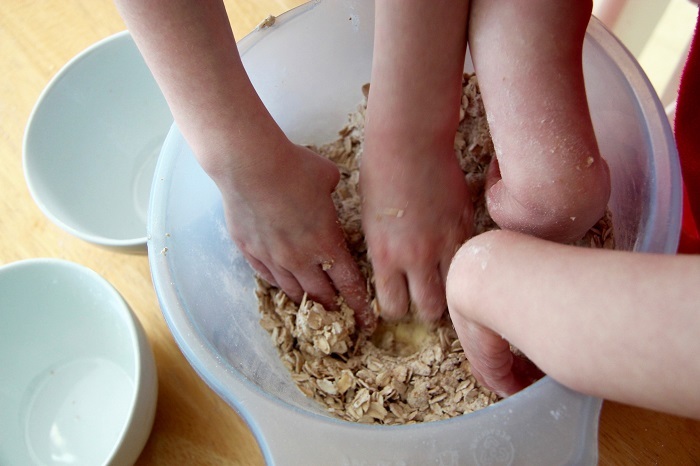 Invite your children to be still, listen, and think like a bird so they can spot the birds in their natural habitat. I always remind the girls to be respectful when we’re out in nature and in animals’ habitats like our favorite Massachusetts Audubon Wildlife Sanctuary. Our favorite place to spot birds is at my dad’s farm. 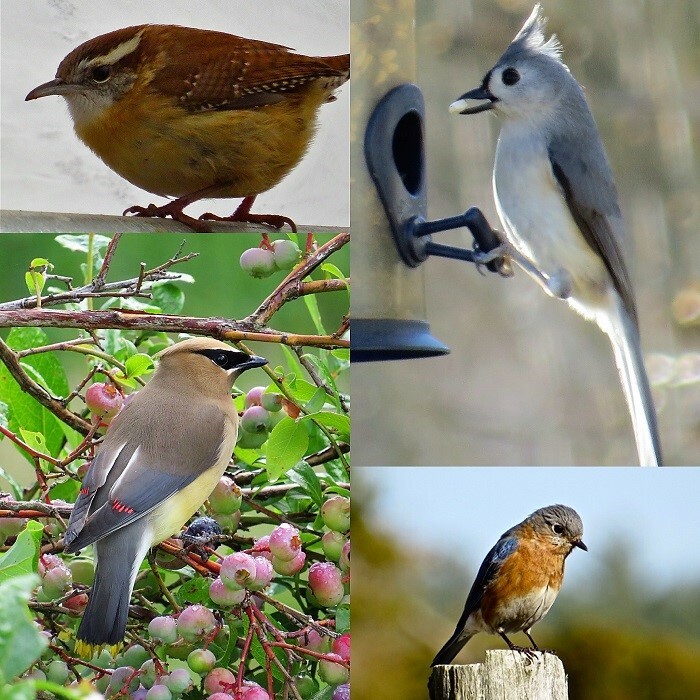 Here is a little montage of the beautiful local birds that call it home! Can you spot any of these birds in your backyard? 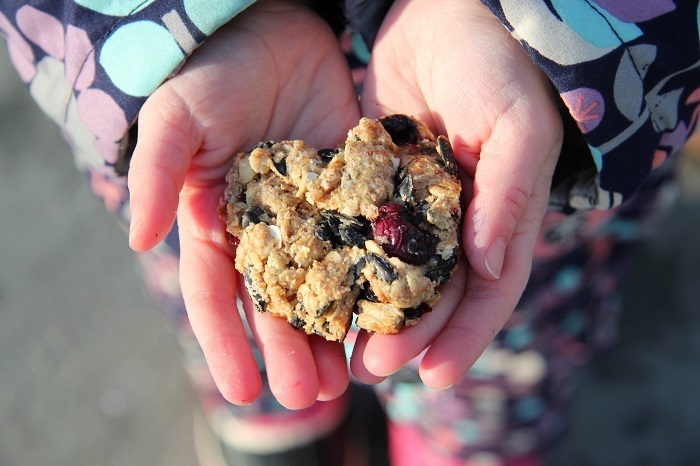 If you’re willing to provide snacks to all your backyard visitors, you can make this bird cookie recipe and leave it outside for the birds to enjoy in any season. 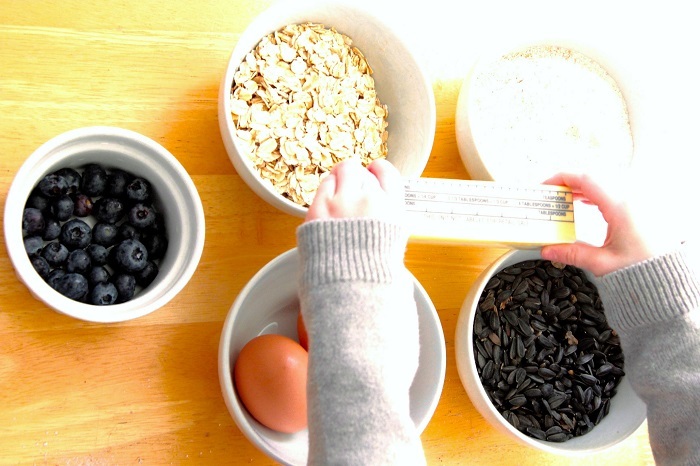 Mix the oats, butter, and baking power by hand until crumbles form. Add the blueberries and birdseed last. Bake the “cookies” at 350 degree for about 15 minutes or until golden brown. Place outside for the birds to enjoy. 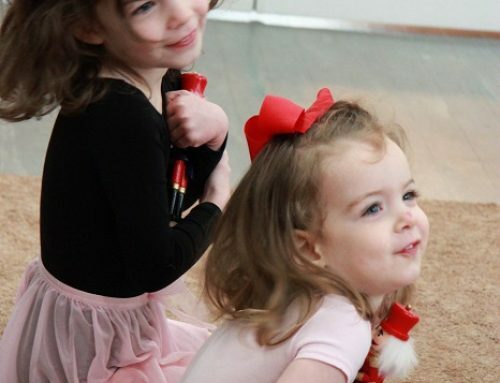 I am a mother of two daughters, a wife, and a publishing freelancer. My own childhood love for learning inspired me to go to college to become a teacher. When I landed my first job as an elementary school teacher, my love affair with children’s books only grew. After moving to New York City to work at an educational publishing company, I learned even more about the critical importance of literacy. 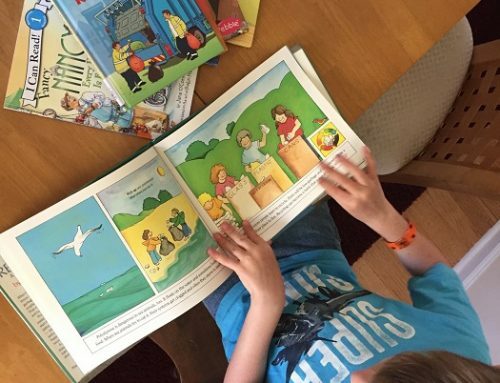 Now, as a mom, my love of reading and the knowledge of how important it is makes reading every day one of our family’s top priorities and pleasures. Great post! 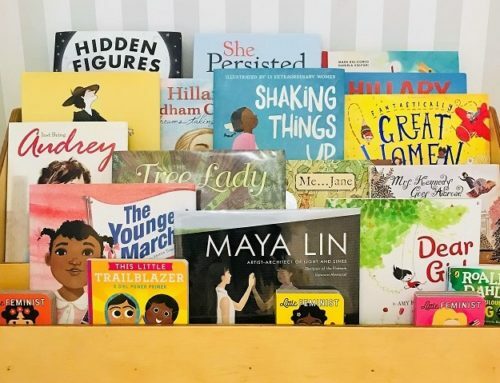 Can’t wait to check these books out with my daughter!